The Guianas – Guyana, Suriname and French Guiana, an overseas department of France – are nestled on the northeastern shoulder of South America. These are among the most forested countries in the world, with over 75% forest cover each, partly due to their low population density. Guyana and Suriname are avid actors in the international wildlife trade, particularly of birds and reptiles. Guyana’s trade has attracted international attention in the past, with pressure placed to encourage the development of adequate export laws, quotas and regulations. While some of the birds exported are species traditionally destined for the pet trade, such as toucans and parrots, the trade also includes the Chestnut-bellied (Sporophila angolensis; locally called towa towa or pikolet) and Large-billed (Sporophila crassirostris; locally called twa twa) Seed-Finches. These are used in competitions referred to, in Guyana as bird racing. Bird racing doesn’t quite demand the speed that might first come to mind. Pairs of males are pitted against each other in a song contest to determine which is the first to reach a predetermined number of song notes. The first bird that does wins its owner fame and glory, while spectators win or lose bets. Well-trained birds can sell for high prices, ranging from $1000 to $5000 USD. 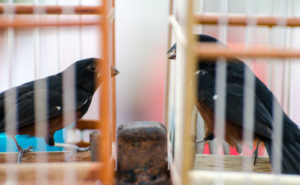 Throughout Guyana’s coastal region, caged songbirds are a common sight, and the (predominantly male) owners have a close connection with their birds. Men often take their birds out, in hand or on their bicycles, spend time picking bird seed and playing tapes on repeat to train them. The network involved in the local trade extends from the coast, where wild populations were once present, to the interior regions, such as the savannas of the Rupununi, where the human population is far lower and mostly comprised of pastoral indigenous communities. Bird racing, however, has not remained confined within Guyana’s and Suriname’s borders. Many Guyanese have migrated to the US and Canada, bringing the activity with them. Bird racing can be observed in places like Smoky Oval Park in Richmond Hill, New York, where Guyanese immigrants gather in the early hours of the morning. 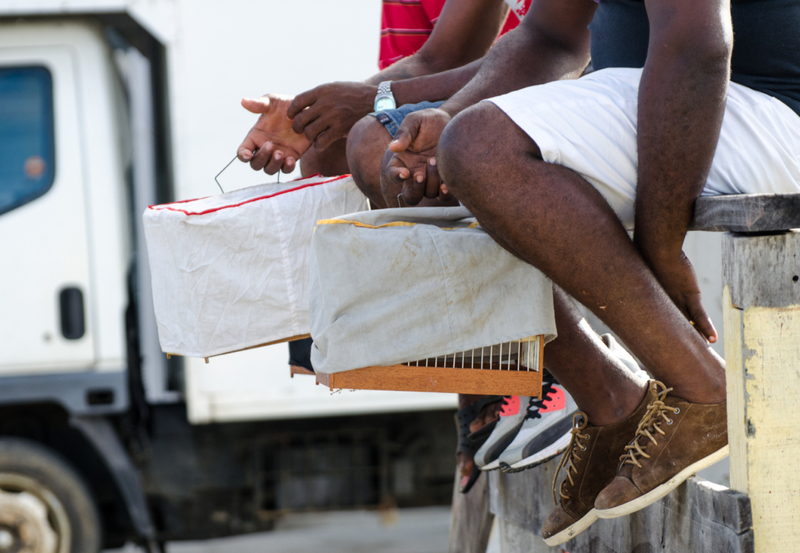 For them, bird racing can be a connection to their home country, and the culture they left behind, but also a way to meet other Guyanese and socialise. The presence of bird racing in North America, however, has caused controversy. There have been investigations, seizures and criminal trials in the US, and at airports in both the US and Guyana, attempts to get live birds through security have made international headlines. Although importing these species into the US is not necessarily illegal, the quarantine requirement is rumoured to affect their song, thus can promote smuggling, as the best trained birds attract the highest prices in the international market. Dedicated bird racers have been willing to risk fines and jail time to avoid this. Although there have been attempts to breed seed-finches for racing, there is a belief that wild caught individuals have better songs, so the demand for wild caught individuals persists. Little population data exists for the species in Guyana and Suriname, but shifts in the demand for these species birds indicates that harvesting may impact their populations. Both the Chestnut-bellied and Large-billed Seed-Finches are declining in Guyana and Suriname and have been extirpated from habitats near to human habitation on the coasts. Racing birds in Suriname are now said to be sourced from Guyana, where the demand has shifted from coastal populations to those in the interior of the country, where indigenous communities have become involved in the trade for financial gain. Despite this, in other parts of their range, both species remain common, and there are still large areas of intact habitat in Guyana and Suriname, which provide opportunity for them to recover. The international trade in seed-finches demonstrates how a human diaspora, attempting to maintain aspects of their native culture can drive international demand for a species. Bird racing, however, is understudied, and much of the knowledge on it, exists in unpublished reports and theses. Better understanding the human behaviour surrounding bird racing could serve as a model system to study the maintenance of culture aligned to the conservation of a species.